View our news and press releases below. Two outstanding women were honored by the Association of Women in Agriculture (AWA) Benefit Corporation at the annual AWA Day on April 13 for their contributions to agriculture and the organization. Cathy Sherman was recognized as the Outstanding Woman in Agriculture and Jessica Wendt was recognized as the Outstanding Senior. Four board members were elected by members of the Association of Women in Agriculture (AWA) Benefit Corporation at the annual meeting on April 13. 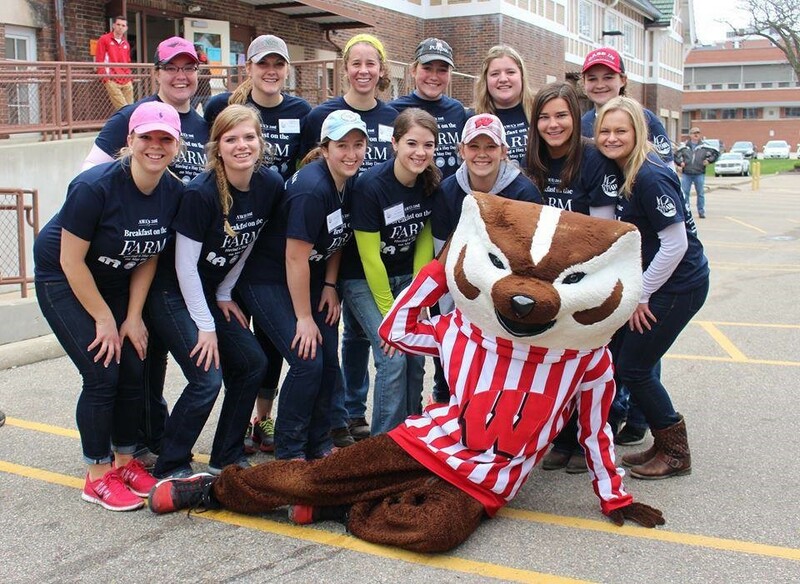 Twenty young women in agriculture are receiving support in their education at the University of Wisconsin-Madison. The Association of Women in Agriculture (AWA) Benefit Corporation awarded 18 scholarships to undergraduates totaling $9,500 at their annual AWA Day on Saturday, April 13. Two additional $500 awards were presented by friends of AWA in memory of two former student members. On Saturday, April 14, at the Association of Women in Agriculture (AWA) annual AWA Day, the AWA alumni awarded 20 scholarships to undergraduate active AWA members, totaling over $11,000. AWA elected their new leadership for the 2018-2019 academic year on April 8th, 2018. Three additional ladies were also selected by the Association of Women in Agriculture Benefit Corporation (AWABC) to serve as the House Manager, House Steward and House Assistant. On February 17th, the Association of Women in Agriculture (AWA) partnered with the Alpha Gamma Rho-Iota (AGR) fraternity with the goal packaging 30,000 meals for the third annual Rally to Fight Hunger event. The 74 participants well exceeded this goal, and packaged 30,672 meals in just under three hours. AWA once again partnered with Kids Against Hunger – Rock County, who provided the supplies for the meals. These meals will be sent to communities as close as Madison, and as far away as Kenya. Over 30 attendees recently gathered to rededicate the student campus home for the Association of Women in Agriculture (AWA) located near the College of Agriculture and Life Sciences campus at the University of Wisconsin – Madison. The purpose of AWA is to help its members prepare for a career in agriculture, as well as provide professional, service and social opportunities. The AWA house serves as a meeting venue, gathering place and service location, as well as a home away from home for all members. The Association of Women in Agriculture Benefit Corporation (AWABC) recently elected new members to the board in April at the annual AWA Day held on UW-Madison’s campus. The AWABC looks forward to welcoming a new class of AWA members this fall and is excited for all that the student membership continues to do on campus and in the agriculture community. On Sunday, April 9th, the Association of Women in Agriculture (AWA) elected a new officer team for the 2017-2018 academic year. Additionally, three young women were selected by the Association of Women in Agriculture Benefit Corporation (AWABC) to serve as the AWA house manager, steward and assistant. The officer team consists of 17 members who work together throughout the year to help plan, promote and execute events in service, social and professional areas. Each officer organizes and plans events in their specific position, however, the whole officer team is essential for the execution of each event. On Saturday, April 8, at the Association of Women in Agriculture (AWA) annual AWA day, the AWA Alumni awarded 19 scholarships to undergraduate women totaling over $10,000.